Easy to apply anti-slip tape with a peel-off adhesive backing. ALL of our tapes are great for use in WET SITUATIONS! Built to last and great glue for any indoor/outdoor use – stairs, ramps, showers, steps, industrial applications, etc, etc.. You’ll find our shipping rates on tapes and paint-on do-it-yourself clear abrasive anti-slip floor coatings ridiculously simple and cheap. Orders over $120 ship FREE!! Express shipping available – call for a quote. 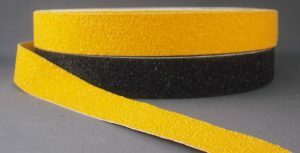 We also carry NON-ABRASIVE ANTI-SLIP GRIP TAPES for tubs, showers, and boats. Custom sizes available. 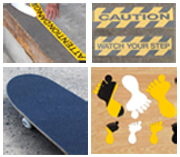 These anti-slip tapes are the best in non-slip protection! Bulk anti-slip tape in black by the case [1 case = (48) 1″x60′ rolls, (24) 2″ rolls, or (12) 4″ rolls]: $475.00 + free shipping. Add $25 for any color other than black. 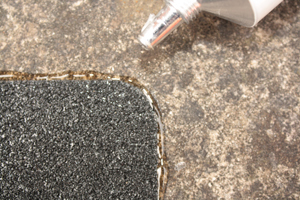 Edge Fix: to further extend the life of anti-slip tapes. Helps protect tape edges from damage by stiletto heels and from water intrusion in highly wet applications. A small amount on the edge creates an excellent bond. Each tube can seal both edges of a 60 foot roll of tape. $21.97 per tube. This is not necessary for our Aqua-Safe tapes. Here’s the MSDS. Our non-skid tapes help assure ADA and OSHA compliance as well as adding safety to your home, boat, bathtub or workplace. Samples of our anti-slip tapes can be shipped to you. Here’s a link to our NON-ABRASIVE ANTI-SLIP TAPES for bathtubs, showers, pools and boats. We also carry glow in the dark non-skid tape! ORDERS OVER $120 SHIP FREE!! Anti-slip tape orders can be ordered securely online, placed by phone (1-800-988-6721), or e-mail us with any questions. We have the best prices and the best abrasive -- durable aluminum oxide. Although all of our tapes are for indoor and outdoor wet area applications, we also carry non-abrasive anti-slip tapes for showers, pools and kitchens where an abrasive surface is not desired. Samples of our anti-slip tapes can be sent to you. Most orders ship same day. 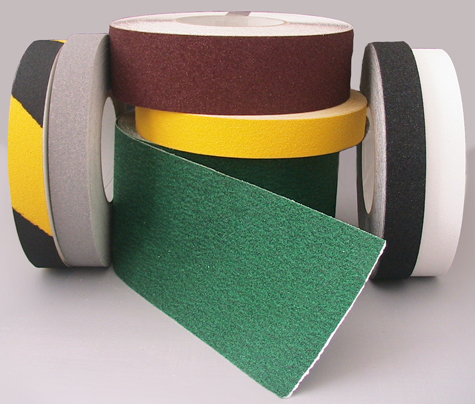 Click here for more information and slip resistance test data on our various tape grit sizes. We can order the sorts of items pictured above from our factory ($100 minimum order), make custom colors (on orders of 10,000 square feet or more), cut them into custom shapes (minimum order of 100 pieces), and print whatever you want onto all of our anti-slip floor tapes. We carry in stock some clear, non-abrasive anti-slip foot-shaped tub stickers. We carry aluminum-backed, conformable anti-slip tapes for diamond plate and other irregular surfaces, and bolt-down aluminum anti-slip plates with coarse anti-slip tape already applied. We offer specially discounted anti-slip tapes that were cut to the wrong size for particular customers or are in discontinued colors. Get these non-skid tapes at a discount! We also carry photoluminescent/glow-in-the-dark egress marking tapes.